Wow! Wrestlemania weekend is exhausting. I must say that I am happy NXT Takeover has moved back to Friday night during Wrestlemania weekend, it definitely feels right in the world of momentum leading up to the big day. It certainly did not disappoint. I will warn you ahead of time, this review will not do this show justice, and it is a must see. While the outcome of this match was fairly obvious to most of the WWE Universe, these two teams did not disappoint. The War Raiders have shown that they can certainly shine on the big stage of NXT Takeover. The match started off with Rowe and Black showing each other a lot of respect, however the pace quickened and never stopped. Towards the end of the match, it looked like Black and Ricochet had it with a Black Mass/Shooting Star Press combo, however the pin was broken up and the match continued. Rowe and Hanson ended up walking away with the victory, however it was the end of the match that was the story. The War Raiders laid down their belts and bowed to the exciting heroes, as their time in NXT is done. 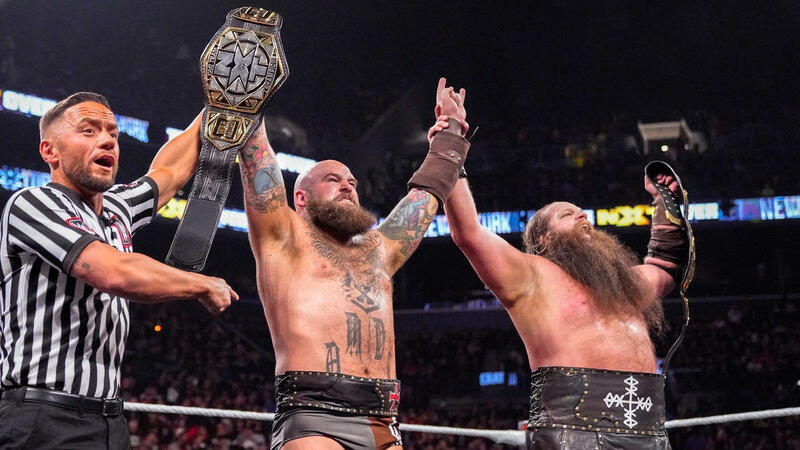 Ricochet and Aleister Black bowed to the Barclays Center fans to a huge ovation, as both superstars hugged and showed emotion, as Sunday night they hit the big stage. Going into this match, I was concerned that the styles of these two superstars were not going to mesh. Boy, was I wrong! The Velveteen Dream showed fans that he deserved the spot, and exactly what they missed out on when he was left off of the card of NXT Takeover: Phoenix. I feared at the start of the match that it was going to be a typical Matt Riddle match where he dominates the offense and walks away with the victory. Dream did a great job selling Riddle’s offense, and eventually mounted a Hulk Hogan-like comeback. Literally, he channeled Hogan and Hulked up, leading up to the comeback. I loved the ending of the match, with Riddle having the Dream locked in the Bromission. It looked like it was all over for Dream, until he reversed it and rolled up Riddle for the victory. More respect after the match, as the Original Bro extended a fist bump to the Dream. While he thought about it, Dream walked off with the championship. Pete Dunne’s reign as WWE United Kingdom Championship has been pretty epic. The night he won the title at NXT Takeover: Chicago was arguably the match of the night. His defense at NXT UK Takeover: Blackpool was a classic and set the bar for what I am looking for in a Match of the Year. 685 days is a long time to be a champion in WWE in this era. While I think Pete Dunne adds some star power to the NXT UK brand, it might be time for him to make the step up to the main roster, and this was his opportunity. As for the match, it is exactly what we all would expect. It was hard hitting. It was hard to watch at times. I don’t know how Dunne doesn’t have a broken rib, or his chest didn’t cave in from all of the chops he took. There was one exchange where WALTER chopped Dunne, only for Dunne to follow up with a shivering forearm to the chin. This went back and forth for a while. Ultimately, WALTER took the WWE UK Championship away from Dunne. I am very interested to see where WWE UK goes next with WALTER as champion. He has already put on some quality matches since joining the brand, we just need to see who his first contender will be. I fully expect to see Dunne debut on Smackdown soon, and if that is true, this match was an unbelievable send-off for the Bruiserweight. This match was the biggest wildcard for me. I wasn’t sure what to expect. The contrast in styles in this match were glaring, with Io and Kairi utilizing their high flying, Bianca with the power game, and Baszler with the technical and power skills. As predicted, Io and Kairi teamed up against Baszler and Belair to start. Eventually the match broke down. There was an amazing spot with Belair stacking up Io and Kairi in the fireman’s carry and hitting them both with the Kiss of Death. Ultimately, the match ended with Baszler sneaking up on Belair and locking her in the Kirifuda Clutch. Unlike Takeover: Phoenix, Belair tapped to end the match. Overall, I was impressed with this match. Baszler looks stronger than ever as champion, as she did this one all on her own. The big question: who is next? We have had two straight Takeovers with Belair involved. Will we get Shayna vs. Io one-on-one? Will someone new step up? Any time that there is a match for a vacant title, there is a lot of anticipation. This one was no exception. While heading into Takeover, this was Johnny’s title to win, as it was supposed to end his storybook feud with Tommaso Ciampa. As Hunter says in the promo, “things change” and now we get a dream matchup between Gargano and Cole. In my opinion, this match started off slow. The first two falls were good, but not great. Adam Cole won the first fall with the Last Shot, while Gargano won the second fall getting Cole to tap to the Gargano Escape. The third fall picked up and made this match memorable. Both Gargano and Cole made this fall feel like it was its own Wrestlemania match. At one point, Adam Cole stole Ciampa’s finishing move, the Fairy Tale Ending, and hit Gargano with it on the announcers table, almost winning by count-out. Gargano even pulled out his old finisher from the Indys, the Hurts Donut. The match broke down at the end with the Undisputed Era distracting and ultimately taking out the ref, and hitting Gargano with the Up and Down for a quick 2-Count. Gargano followed up by taking out Strong, Fish, and O’Reilly in an outstanding offensive barrage outside of the ring, only to be hit by a superkick as soon as he slid into the ring. I truly thought it was over until Gargano kicked out. Gargano eventually dodged a Last Shot and locked Cole in the Gargano Escape for his second tap-out victory of the night to end his storybook run and finally become NXT Champion. Candice LaRae came down to celebrate with Johnny as they made their way through the crowd and eventually up the ramp. The two raised their arms for the crowd, only for Tommaso Ciampa to come out, neck-brace and all. Gargano turned around and received a warm embrace from his best friend/bitter rival. The three of them raised arms on the stage as the show went off the air. This card top to bottom was outstanding, hands down one of the best Takeovers all time. Even the ones that I have held highest had a few down-points, or an awful squash match in between. This card stood out and every match was at least 4 Flames in my eyes. Check it out for yourself if you haven’t seen it yet, and let me know your thoughts on Twitter @TJoftheJK . Previous postWhat is the worst Wrestlemania ever? Next postJoestopper’s Cruiserweight Report 4/9: A Premier Title Reign?